Central systolic blood pressure (SBP) may differ between individuals with similar brachial SBP, which may have implications for risk assessment. This study aimed to determine the variation and potential clinical value of central SBP between patients with similar brachial SBP. Brachial SBP was measured by sphygmomanometer and central SBP by radial tonometry in 675 people (430 men), comprising healthy individuals (n = 222), patients with known or suspected coronary artery disease (n = 229) and diabetes (n = 224). Individuals were stratified by brachial SBP in accordance with European Society of Hypertension guidelines (optimal, normal, high-normal, grades 1, 2 and 3 hypertension). The potential clinical value of central SBP was determined from the percentage of patients re-classified into different brachial SBP groups due to the difference between brachial and aortic SBP (defined as brachial SBP-central SBP). 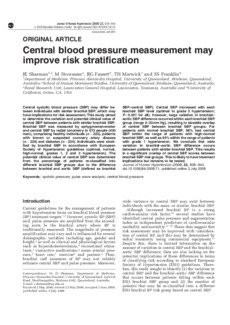 Central SBP increased with each brachial SBP level (optimal to grade 3 hypertension; P < 0.001 for all). However, large variation in brachial-aortic SBP difference occurred within each brachial SBP group (range 2-33 mmHg), resulting in sizeable overlap of central SBP between brachial SBP groups. For patients with normal brachial SBP, 96% had central SBP within the range of patients with high-normal brachial SBP, as well as 64% within the range of patients with grade 1 hypertension. We conclude that wide variation in brachial-aortic SBP difference occurs between patients with similar brachial SBP. This results in a significant overlap of central SBP scores between brachial SBP risk groups. This is likely to have treatment implications but remains to be tested.